compared to its main competitors. Through Happ Monitor you can see things from the perspective of an SEO specialist. You do not need advanced knowledge because everything is based on intuitive digits and charts, easy to follow. We will provide you weekly or monthly reports on the evolution of the performance indices set by the SEO campaign and reports regarding the competitors. In Dashboard (a.n. 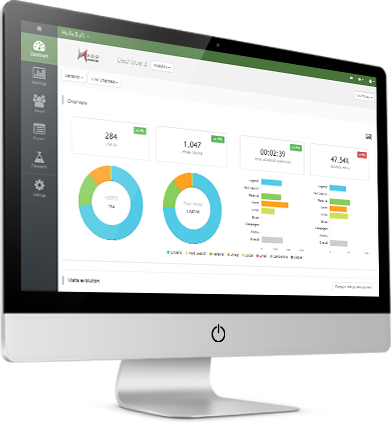 – the first page of the application), you can find data processed by Google Analytics and Google Webmastertools, interpreted and displayed in a manner easier to be understood. You will immediately notice the evolution of your website in a particular time frame, without needing advanced knowledge. You will be able to observe, in real time, the evolution of your website, in main search engines, based on promoted key phrases. You will have complete details for each expression: monthly search volume, CPC, the competitiveness and many other information that will help you understand better your SEO campaign. You will oversee the two main competitors in search engine, based on all the key phrases, and you will be able to compare the development, therewith your website. You will observe your competition and learn from their mistakes, to find the best solutions for your business. Each month, you will receive automatically, through the platform, a detailed report regarding the development of your website during the previous month.